From IBM’s souped-up supercomputer Watson to Google’s tricked-out, self-driving cars, marketers are navigating a new wave of tech services and platforms beyond the walls of traditional advertising. Augmented reality, chatbots and artificial intelligence are all poised to become a bigger focus for marketers in the coming years, and advertisers are already starting to experiment with tech coming out from Facebook, Google and Apple. Meanwhile, other companies like Amazon and Waymo are just starting to give marketers a peek at their most forward-looking innovations. Needless to say, there’s a lot for marketers to dig through when figuring out what tech is worth investing in and which trends are simply fads. As part of Adweek’s monthlong Next Tech series exploring marketing tech, we’ve highlighted eight emerging technologies and what marketers need to know about them today and in the future. While brands have poured millions into VR platforms like Facebook’s Oculus and Samsung-owned Gear, the marketing potential in Microsoft’s mixed-reality device HoloLens remains relatively untapped. But the wearable could be huge as a visual search engine that layers holograms over the real world. Among HoloLens’ early brand adopters are Lowe’s and Cirque du Soleil, both of which have created applications that visualize how big items like stage sets and refrigerators fit into physical spaces. Meanwhile, the PGA Tour designed a HoloLens experience that lets fans interact with golf courses as part of a three-year deal with Microsoft. Microsoft is working hard to get its technology into the hands of more developers and agencies. 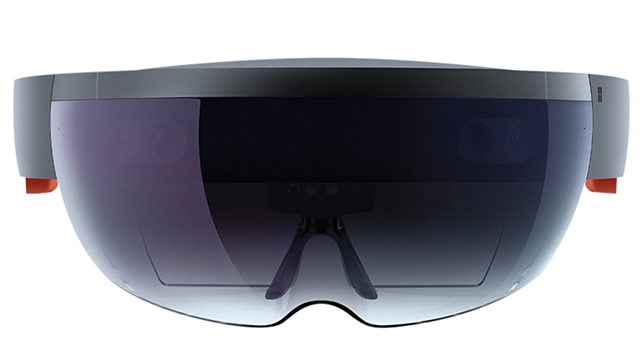 Last month, the tech giant expanded the number of creative and digital agencies involved in its HoloLens Agency Readiness Partner Program, which helps clients make apps, from 10 to 30. The Redmond, Wash.-based company is also developing a proprietary artificial intelligence chip for HoloLens 2.0 that uses visual search to instantly detect the items that users are looking at while wearing the goggles. “AR really isn’t AR without artificial intelligence,” notes James McQuivey, vp and principal analyst at Forrester Research. “Because AR needs to be able to interact with your physical world in an intelligent and natural way, the more intelligence it can apply, the more compelling it will be—not just to recognize objects, places and people but to understand your relationship to those things and begin to connect you to those things in better, more intuitive ways.” — L.J. At Google, self-driving cars are already taking a real-world spin. After reorganizing its autonomous car division Waymo into an independent company under parent organization Alphabet last year, Waymo’s fleet of more than 600 Chrysler Pacifica minivans and Lexus SUVs equipped with self-driving sensors and software is now cruising around Phoenix and being tested in Kirkland, Wash., Mountain View, Calif., and Austin, Texas. Unlike competitors including Nvidia, Intel and Uber, analysts say Waymo has the full package of assets and technology that it needs to dominate the self-driving space. Alphabet’s company has also reportedly been in talks with Honda about installing self-driving systems into its cars. After a public lawsuit claiming that Uber stole its trade secrets unfolded earlier this year, Waymo also inked an intriguing partnership with ride-sharing app Lyft. The two companies are working together on pilot projects and product development while Waymo gets access to data about Lyft’s millions of riders. Still, Waymo will need to work with even more partners to make self-driving cars mainstream. “Waymo is the clear leader in the software that will control the autonomous vehicle,” says Michael Ramsey, research director at Gartner. “Their issue is going to be getting people to work with them. Google clearly sees huge promise in the technology and it has the chance to be world changing, but at some point they will need a partner in automotive and will need to be willing to collaborate and not just dictate terms.” — L.J. Of all the companies using artificial intelligence today across industries like marketing, healthcare and more, it’s IBM Watson that has made the biggest effort to help consumers understand its many potential uses. While AI is often touted as a silver bullet for brands, Watson in particular has become a popular way for companies to use big data to create big impact. “Being AI in itself doesn’t make you a better model, and it’s easy to get lost in that,” says Ari Sheinkin, vp of marketing analytics for IBM Watson. Over the next 12 months, Sheinkin—who admits he wasn’t always a believer in AI—predicts that Watson’s deep-learning capabilities will evolve more rapidly than he would have expected even just a year ago. However, while Watson might be able to ingest more data at once than will ever be humanly possible (e.g., millions of pages within a short period of time), the limits of man and machine remain unexplored territory. —M.S. After years of speculation, Apple is finally making its first foray into augmented reality this fall, launching a platform dubbed ARKit in the iOS 11 software that will equip millions of iPhones with AR and give developers and brands the tools to make AR apps. While the number of AR platforms for marketers continues to grow, Apple’s combination of software and hardware could finally push the technology into the mainstream. Ikea plans to launch one of the first apps built with ARKit this fall that will allow consumers to take pictures of their homes and place virtual graphics of furniture over them so that they can see how a piece looks in a room. “This is a category ripe for AR’s benefits,” Jensen says. “Gaming and entertainment is another one where we will see a ton of consumer adoption. I expect that brands will find ways—like we see in esports—to integrate their messages and find sponsorship opportunities that fit.” —L.J. Virtual reality seems to be one of those mediums perpetually stuck in the purgatory between hype and hope. Oculus, which Facebook acquired for $2 billion in 2014, has been described by Facebook CEO and VR evangelist Mark Zuckerberg as the “chance to create the most social platform ever, and change the way we work, play and communicate.” And while it’s only been a couple of years since Oculus’s founders raised an early $2.5 million on Kickstarter—long before VR had taken off with users, brands or media companies—the medium has become a powerfully potent way of sharing messages and stories for marketing and journalism. Recently, brands as varied as hiking outfitter Merrill and shows like Game of Thrones have created VR experiences, while Facebook itself has been building out its own VR social network, called Spaces. Journalism outlets and nonprofits also have been using immersive storytelling to bring viewers closer to crises around the world than ever before. Although industry experts may debate how long it will take VR to reach mass adoption, the technology is unquestionably poised to keep growing. According to a report released late last year by the research firm SuperData, the VR hardware market could reach $2.7 billion this year before more than doubling in 2018 to $6 billion and then doubling again by 2020 to $12.1 billion. Consumer software and services markets will also increase, reaching $1 billion this year and hitting $16.2 billion by 2020. —M.S. For years, Amazon has been encroaching on established retailers’ turf—and now it’s about to do the same to digital advertising by potentially taking on the duopoly of Facebook and Google. Equipped with data about what products people are looking at online and a trove of consumers’ credit card information, the Seattle-based retailer is building an advertising and marketing tech stack to pitch targeted search and programmatic ads. But ads are only the tip of the iceberg when it comes to Amazon’s impact on marketers. The popularity of Amazon’s Echo devices is driving marketers to create voice-activated branded apps that help consumers discover and use products. Meanwhile, agencies like WPP’s Mindshare and Possible are helping brands stay ahead of the curve by building Amazon-specific services that help clients develop specific strategies for marketing through the ecommerce giant. In the future, “one could assume that [Amazon’s] artificial intelligence or algorithms will be able to order you clothing,” WPP CEO Martin Sorrell said recently when explaining Amazon’s power. “You can try it on, like you would in the changing room of a bricks [and mortar] retailer, using digital technology. So the data that comes from that will become critically important.” —L.J. Facebook’s stand-alone messaging app has become an increasingly prominent place for marketers interested in reaching the more than 1 billion users on the platform. Earlier this year, Facebook began testing ads within Messenger that appear on the app’s home screen, giving brands a new canvas outside of the newsfeed to reach consumers while they talk with friends. But it’s not just humans that are using the platform. Thanks to the thousands of Messenger chatbots built by developers around the world, Facebook has rapidly built out another network for users to interact with companies and characters for customer service, shopping or entertainment. Of course, Messenger isn’t the only popular messaging app. Others like Canada’s Kik, China’s WeChat and Japan’s Line all have larger user bases (not to mention the more than 1 billion users on Facebook’s own WhatsApp). But in the U.S., it’s Messenger that’s the most mainstream. —M.S. When Google first unveiled Glass in 2013, it was a PR success but a commercial embarrassment, with the $1,500 prototype failing to catch on with users interested in the head-mounted displays. (In 2015, an executive for Google’s experimental lab Google X said one of the company’s biggest mistakes was marketing the product before it was ready for mainstream use.) Marketers’ hopes for the product were shattered when Google shelved it just two years after its launch. But Google Glass is now getting a surprise second act: Last month, Alphabet—Google’s parent company—unveiled plans for a reboot that’s focused less on consumers and more on enterprise use, with a new version of the technology called, fittingly, Google Glass Enterprise. While this latest model is less about attracting wannabe cyborgs than serving people in industries like manufacturing, healthcare and agriculture, the increasing adoption of other heads-up displays like Microsoft HoloLens and various VR headsets over the past few years could help people see Glass in a different light. Kraut predicts that the next five to 10 years will see both the evolution and the extinction of today’s devices. “Augmented reality will ultimately become the single device that humans use for content consumption and engagement,” he says. —M.S.